TRP165 Series core profile thickness is 165mm, two widths are available: 480mm and the extra wide 510mm. They feature a capacity of up to 6385kg and are ideal for use as car ramps or lightweight plant ramps. TRP170 Series core profile thickness is 170mm, available with a width of 530mm. 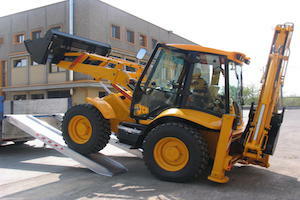 They feature a capacity of up to 8300kg and are ideal for use as plant ramps and mini digger ramps. See vehicle ramps for a full list of features and options. TRP185 Series core profile thickness is 185mm, available with a width of 530mm. They feature a capacity of up to 10000kg and are ideal for use as plant ramps and mini digger ramps. See vehicle ramps for a full list of features and options. TRP200 Series core profile thickness is 200mm, available with a width of 600mm. 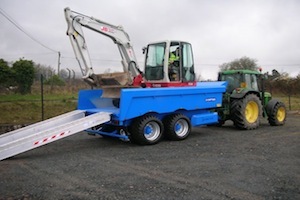 They feature a capacity of up to 12000kg and are ideal for use as plant ramps, for digger ramps and for tele-handlers. TRP230 Series core profile thickness is 230mm, available with a width of 600mm. 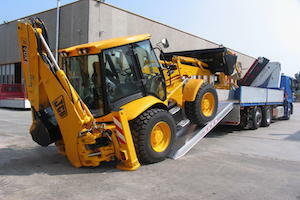 They feature a capacity of up to 14000kg and are ideal for use as plant ramps, for digger ramps and for tele-handlers.